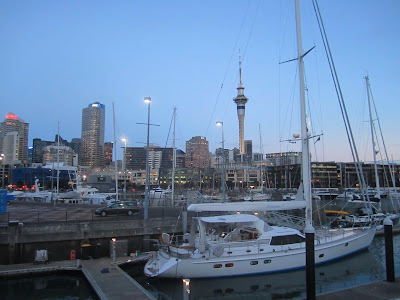 I feel like going to a happy place right now, so I'm going to write the trip story about Auckland, the first stop on our recent New Zealand trip. 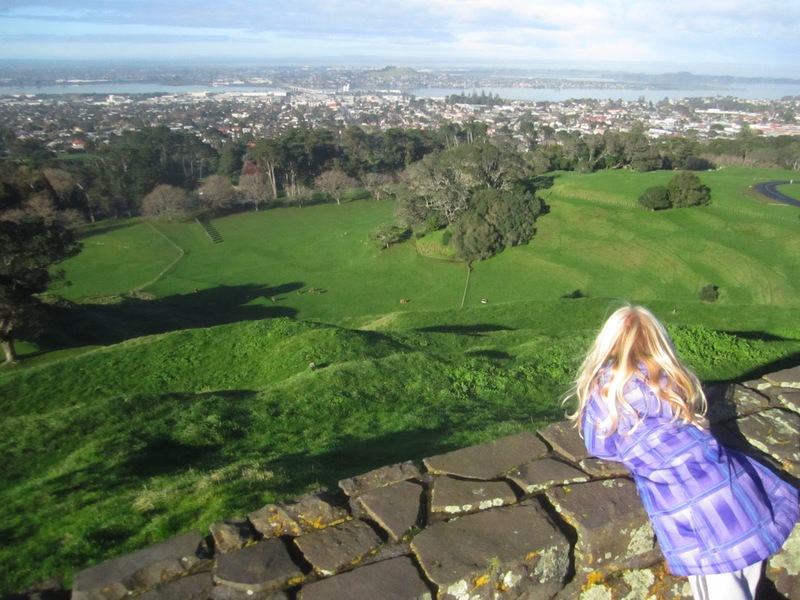 I've been to Auckland many times before, so there wasn't a lot of novelty on this visit. Still, it was fun showing some of our old favorites to the kids, and also checking out some things that we might not have visited without the kids- like the playgrounds. It turns out, visiting playgrounds was one of my favorite things about this trip. It was fun to see the different equipment, and how our kids reacted to it. Every playground we visited had something new, and they are still talking about their favorites. The first place we headed after getting our rental car was One Tree Hill. We dragged the kids up to the top of the hill to admire the view, but the true highlight (and reason for the stop) was the playground. We thought they might enjoy running around a bit after the long flight, and they did. The playground had an awesome train on a concrete track, powered by push. Petunia loved it. All in all, heading to a park first thing was a good move- it got the trip off to a good start for the kids. We went from the park to our hotel, which was basically at the foot of Queen St., the main shopping street in the Central Business District. We had a serviced apartment at the Waldorf Celestion, so the kids had their own room AND we had a living room/kitchen area. (I love favorable exchange rates....) The room reminded me of the serviced apartment I stayed in when I visited Mr. Snarky's department for work back in the early days of our relationship, so my opinion may be a bit clouded by happy memories, but it was a nice apartment. The location, while not as perfect as it seemed when we booked, was still pretty convenient. I think that next time we might try staying in Newmarket or some area other than the CBD, though. Anyway, the first day was taken up by things like buying groceries and getting a proper warm coat for Petunia. We had one on loan for Pumpkin, but the one we brought for Petunia was quickly found to be inadequate. We finished the day with a trip to another playground- this one in Victoria Park. The kids loved the bus ride we took to the park, and again enjoyed the new equipment. Petunia was particularly impressed with the swing that was low enough to the ground that she could swing on it herself. Mr. Snarky particularly enjoyed the good view of the Sky Tower. After a dinner of pizza (for us) and plain pasta (for the kids), we headed to bed early, feeling pretty good about our first day. The next day we headed to the zoo. The day started off well- we stopped by Mr. Snarky's old "local" mall and got a snack at a muffin place (Petunia, it turns out, rather likes cheese scones). I bought my magic red purse, and it was even on sale. We left the mall and drove to the zoo confident that the kids would love it. Alas, it was not to be. The adults were pretty impressed with the zoo- they've got a great native New Zealand section, with a particularly cool the nocturnal room with simulated glow worms on the ceiling- but the kids were not. Perhaps the jet lag and the weirdness of having everything be almost right but just a little bit different got to Pumpkin, but she didn't really enjoy looking at the animals. Then at lunch, the girls both decided to be scared of the chickens that roam free (perhaps in a nod to the Pacific Island heritage? I'm not sure) and the seagulls. The mood was partially rescued by some ice cream, but then spoiled again when I couldn't be patient enough with the "show" Petunia wanted to put on in the little amphitheater seating area they had near the dining area. Regardless, the grown ups definitely enjoyed the zoo more than the kids- although there were things the kids liked, such as the rope bridge in the New Zealand fauna section. We were feeling a bit beaten after the zoo experience, but a rest in the hotel perked everyone up- except for Pumpkin, who took an uncharacteristic nap and really did not want to wake up from it. I finally convinced her to eat something, and she eventually also perked up enough to head out for our next outing, which was to the Sky Tower. 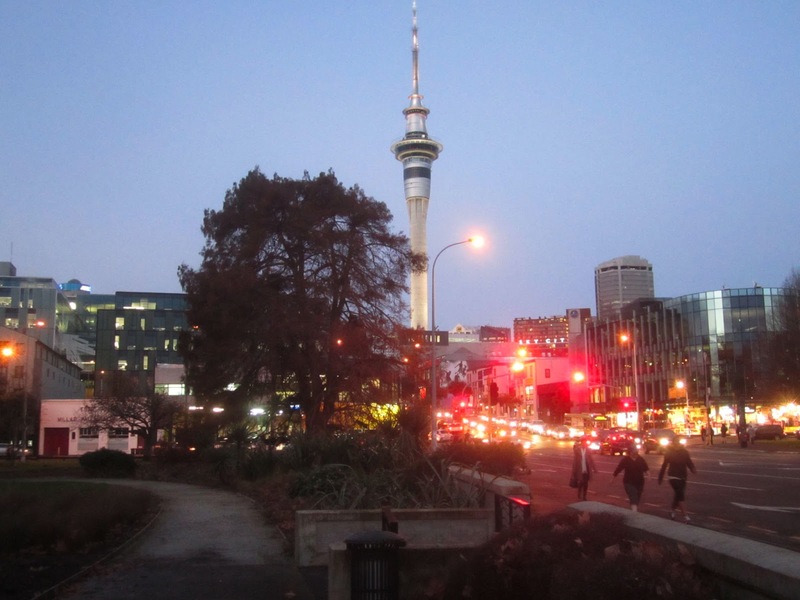 If you had asked me ahead of time, I would have predicted the kids would love the zoo and be unimpressed by the Sky Tower, but I got that exactly backwards. They loved the Sky Tower. If we'd had another hour to sit there, they probably would have been happy. They liked looking at the view from such an unusual perspective. And they really liked watching the occasional adventurous person doing the "Sky Jump," which is a basically an controlled free fall that takes the jumper right past the observation deck, facing in, so that the folks in the lounge can see their grin/scream/grimace/whatever. To each their own. 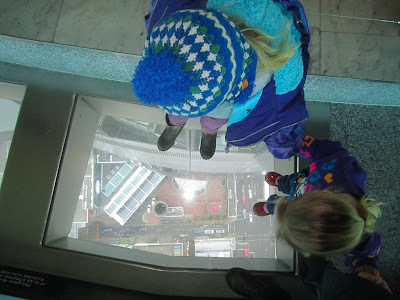 Perhaps I had better prepare myself for the day when one of the kids tells me they're going bungee jumping, though, because their favorite thing in the Sky Tower was standing on the glass section of the floor, looking down. This is not something I choose to spend much time doing. We had to leave the Sky Tower after less time than the kids really wanted because we'd arranged to meet some friends for dinner in Wynyard Quarter, a relatively recently revamped part of the waterfront. 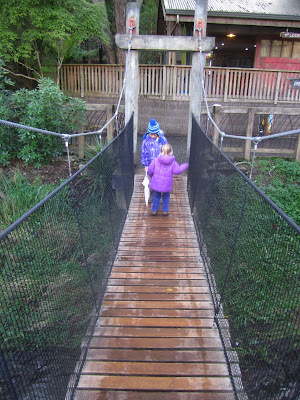 We enjoyed it, and could tell that it would be even nicer on a nice sunny day, as opposed the to drizzly evening we chose to visit it. Despite the less than ideal weather, I'm glad we checked this area out. 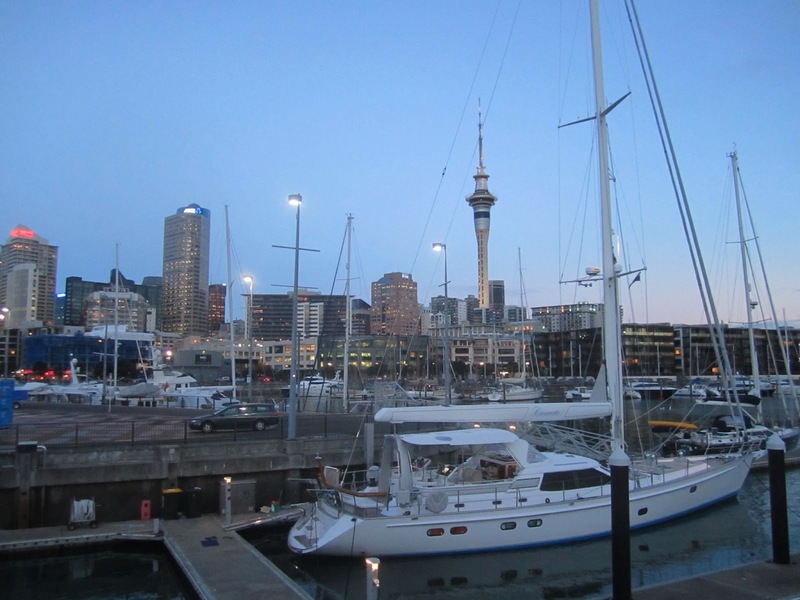 I always thought that Auckland could do more with the waterfront nearest to its CBD. I guess hosting the Rugby World Cup gave them the impetus to do it, and they did a nice job of it. I loved reading this as an almost NZer from Australia. As a child, I spent many happy hours in that playground at One Tree Hill (my grandmother lived around the corner). And as a parent travelling, I too seek out playgrounds, I love the way they make you almost a local. And I see from your other post that you visited the playground in Davenport too - my boys really enjoyed that one after the ferry ride (back when they were your girls' ages). Next time (I'm sure there will be one), I recommend MOTAT - I loved the way everything was outside and you can wander around idly climbing on old trains and tractors. MOTAT was on our "maybe" list this time, but it didn't end up fitting in. I think that one of the best things about visiting playgrounds while traveling is that it is easy to strike up conversation with the locals, much like you do at your own playgrounds at home. We've gotten some awesome local tips on places to visit that way! Traveling with dogs and cats can be hairy. We've witnessed some sort of stressed poodle virtually block the proprietors with drool with a 3km quest! Soaring can be even more struggling with.